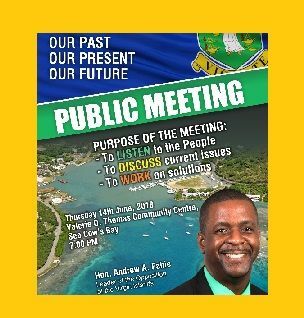 The meeting this evening will begin at 7:00 P.M. at the Valerie O. Thomas Community Centre in Sea Cows Bay, on the main island of Tortola. Huge crowds of residents have been turning out to his meetings on the sister islands, and Hon Fahie who is also Chairman of the Virgin Islands Party (VIP) has been bringing forward an aggressive legislative agenda calling for transparency, accountability and good governance. 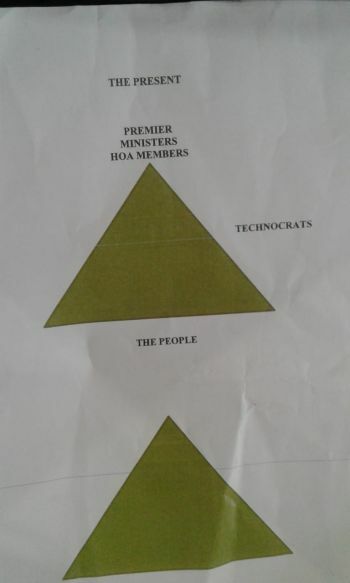 The First District Representative called for ‘Whistle Blowing Legislation’ to help reduce government corruption and to protect civil servants from victimisation, once they report wrongdoing. According to Hon Fahie, he is also keen on legislation that caters for integrity in public life and to strengthen the registrar of interest policy. Another important part of his legislative agenda—should his VIP take power—is a review of government’s procurement systems for contracts. This, in order to bring more accountability and fairness, he said. Hon Fahie has been telling the sister islands about things he will be doing to address their needs including banking and ‘wait time’ for government services, while on Tortola, as he listened to other concerns and grievances. Another of his theme to the people in his public meeting as Leader of the Opposition was for residents to “flip the pyramid,” since, the Premier and his Ministers along with the House of Assembly Members and Technocrats are at the top of the ‘power pyramid’, and the people are at the bottom. He said the people are at the bottom of the power structure, “forgotten and disrespected” and its time the people exercise their power. The former Minister for Education and Culture series of meeting is under the theme Our Past, Our Present, Our Future.